Q. 1: What is the SSPX? The Society of St. Pius X is an international priestly society of common life without vows, whose purpose is the priesthood and that which pertains to it. The SSPX was patterned by its founder, Archbishop Marcel Lefebvre, after the religious societies of foreign missions. The spirit of the SSPX is essentially apostolic, because such is the Holy Sacrifice of the Mass, and because the members of the Society will have in general to exercise an exterior ministry. A “retired” archbishop, His Excellency Marcel Lefebvre, agrees to help a handful of young seminarians who are disconcerted by the direction being taken in post-Vatican II seminaries in their priestly formation. He does this, not only by undertaking their training, but also by founding a Society aiming at fostering a priestly life according to the wise norms and customs of the Church of previous days. SSPX: 40 Years of Fidelity DVD now available! For over 40 years, the SSPX has stood firmly for the purity of the Faith and the glory of Catholic tradition. In honor of the 40th anniversary of its founding, Angelus Press produced this beautiful documentary of this great work of God. The Society of St. Pius X (SSPX) is officially recognized by the local ordinary of Lausanne, Geneva, and Fribourg, Bishop Charriere. It is therefore truly a new little branch pushed forth by the Church. 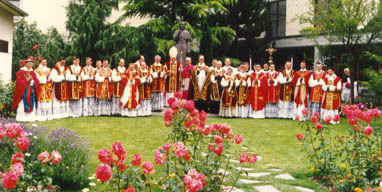 Archbishop Lefebvre announces, together with the staff of the International Seminary of St. Pius X at Econe (Switzerland), the refusal to adopt the Novus Ordo Missae (cf. question 5). By its 25th anniversary, the SSPX numbers four bishops, over 360 priests, 50 brothers, 120 sisters and 53 oblate sisters, all living in 140 houses in 27 countries. Together they seek the goal of the priesthood: the glorification of God, the continuation of Our Lord’s redemptive work, the salvation of souls. They accomplish this by fidelity to Christ’s testament, the Holy Sacrifice of the Mass (cf. appendix 3). After the meetings of the theological commission, Pope Benedict XVI began proceedings in an attempt to provide a canonical solution to the SSPX's situation. Throughout all of this, Bishop Fellay has continually upheld Archbishop Lefevre's uncompromising position to the Modernist errors of the Second Vatican Council. Meanwhile, the SSPX has continued to steadily grow throughout the world,as indicated by the statistics below.